Before the Marts we had street fairs where people traded in animals. 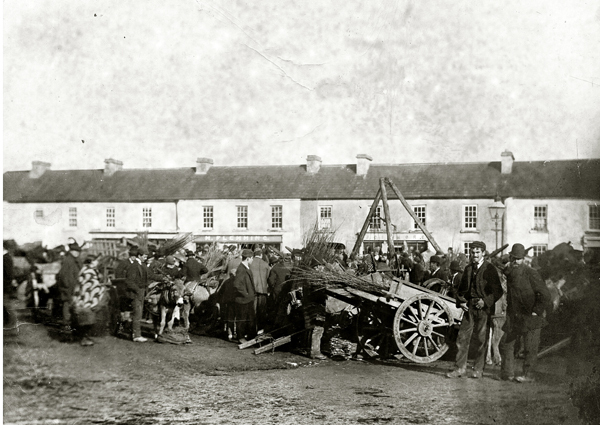 The fair days and market days were very common in every town in Ireland and was a tradition that went back hundreds of years into the very heart of our Irish heritage. 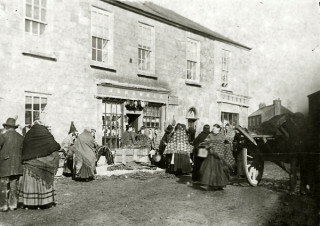 The markets were usually weekly such as takes place in Mountbellew each Tuesday even to this day. The fair was the fore runner of the modern Cattle Mart and was used by the farmers area and surrounding areas for trading animals which were the chief produce generated by farming the land on most farms. 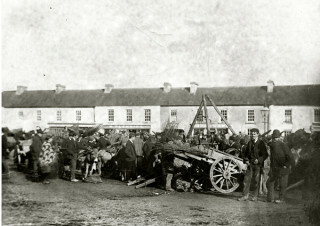 Fairs were important meeting places in rural Ireland and people attended them not only to transact business but also with the expectation of meeting other farmers from further away places, seeing how prices were at this time and gauging how supply and demand was in order to get an idea of the best time to sell what they, themselves might have coming up for market later. Of course it was a social occasion as well and a chance to meet friends and relations and adjourn to the pub for a few drinks. At the fairs all kinds of social networks operated: town met country, farmer met dealer, buyer met seller, the rate collector set up office and collected the dues. Accounts were settled with the local shops and suppliers and there was a huge commercial buzz about the place. Deals were made and deals were set up, hands were slapped, large rolls of bank notes were to be seen – money was changing hands everywhere. The work began around 2.00 am when the animals were driven out on the road and the long procession began. Animals in those days were very quiet and tamer then than they are today. At day break, small herds of animals could be seen on all the approach roads to the town. It was important to be as early as possible to get the best location on the street to pen the animals in order to bring them to the attention of good prospective buyers. In the town the publicans and caterers stocked up in anticipation of a record day. Many a school boy awaited this day with eager anticipation of a day off school and the excitement of attending and sharing in what was seen by every boy as a “man’s world”. The buyers were in the area on the night previous in order to research the market and get an idea of local prices and expectations. It was also good to get to know if a farmer who would be known for quality animals was likely to be bringing any stock to the fair on the following day. The buyers often employed the services of a “tangler” or “blocker” who’s job was to buy cheaply from the farmer on the outskirts of the town as many farmers were unsure of the true value of their livestock. The blocker, an experienced and astute judge often succeeded in clinching a deal. Later on in the morning he turned over his purchases to the dealer for a few pounds profit. Wheeling and dealing always played a big part in Irish life going back to the days of bartering. On some occasions or at particular times of the year trade at a particular fair might not be as good as expected. This could be caused by over supply of stock, facing into a bleak winter or indeed coming out of a bad winter with little or no fodder. Farmers, often desperately in need of money, sold stock at low prices or even at a loss on such occasions. After one such fair in Mountbellew, having sold an old cow – a bad one!, a neighbour of our’s on his return home met my father. Of course dad asked how he got on. He replied: ” We didn’t get what we were expectin’, ………..(pause)………… but then he did’nt get what he was expectin’ either”! Of course the fairs were not solely for of buyers and sellers of livestock. A good fair always attracted other business to the town. Stalls were set up selling second-hand clothes, tools, crockery, items of hardware and even meat and fish. 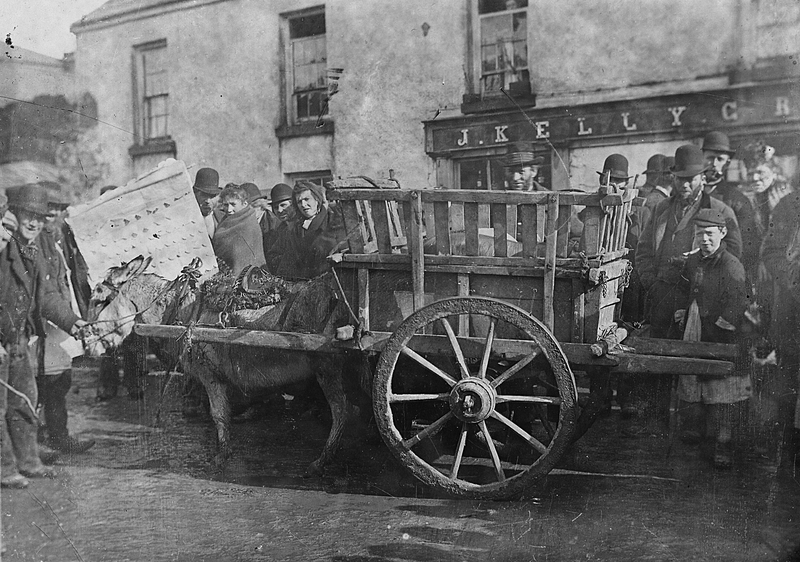 Miko Ralph from Tuam wouls be selling herrings and also empty barrels which were the source of collecting and storing water on many farms. They were known as “Jack cheaps”. 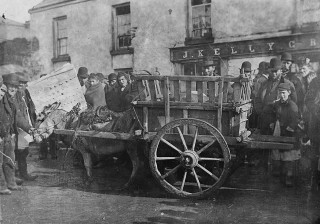 Joyce’s from Ballymoe also had stalls selling everything such as penknives, notebooks, glasswaer, ladders, buckets and cans. to an anchor. They were excellent salesmen. The asking price of an item was high but was lowered quite quickly and you felt always that you were getting a great bargain. It was a great day out for any schoolboy admiring, longing for and even getting to buy some of the “magical” trinkets on offer. 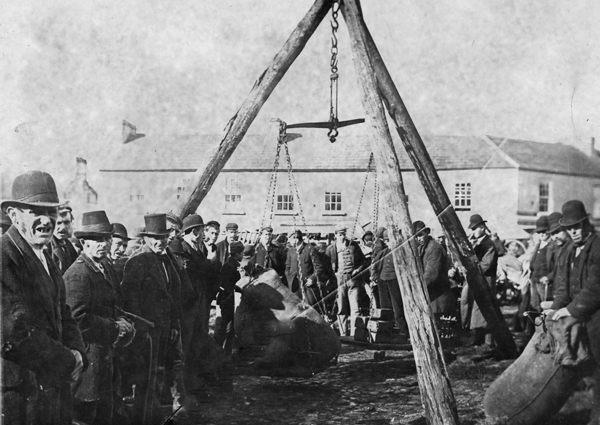 Abbeynockmoy, Ahascragh, Athenry, Caltra, Castleblakeney, Kilconnell, Monivea, Moylough and Mountbellew held a number of fairs each year. Menlough, itself, held just one each year on the first Friday of September. All of the annual fair days were listed in Old Moors Almanac each year – a publication with a green cover that was popular in every household. This page was added on 15/12/2014.